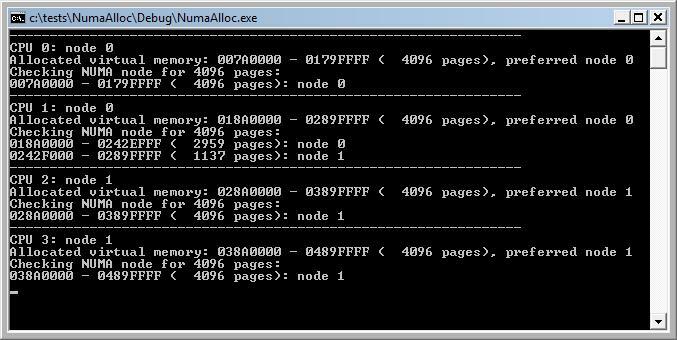 The example given in the MSDN in the article titled "Allocating Memory from a NUMA Node", which is linked to from the VirtualAllocExNuma description, represents several extremely bad coding practices. It looks like a beginner wrote it. This project cleans up the code and makes it look like it was written by a programmer with more than six weeks' experience. For critique of the original code, see this article. The output from the program is shown below. This represents one test on one snapshot of one Vista machine. I changed the specs a bit; the original wanted a command line argument of the number of bytes to allocate, expressed in hexadecimal. This certainly made no sense as a user interface. 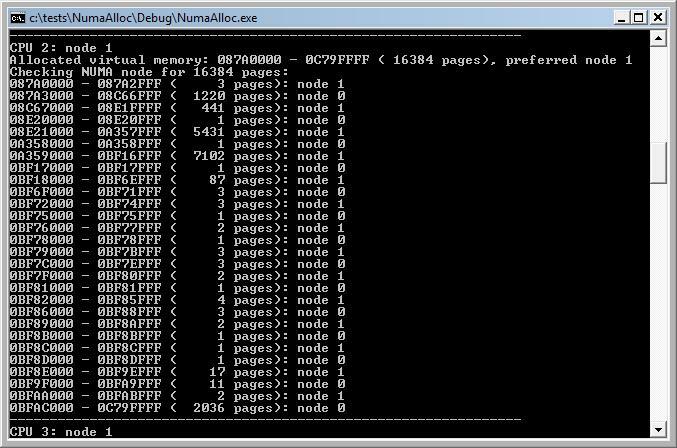 I changed it to take a quantity of pages expressed as a decimal number. The subroutines shown were adapted to work in my NUMA Explorer. Compare the two side-by-side. Note that to reduce the column width, a few comments and long lines of both sources have been re-wrapped. // and allocate some memory from it. // some pages could have been trimmed already). // makes this so easy! Note the example was written in C++!